The Texas Health and Human Services Commission (HHSC) is the largest state agency in Texas and one of the largest in the entire nation. The state’s current two-year budget totals $217 billion; HHSC is responsible for about $80 billion of that. Given the sheer number of dollars involved – and the important programs it oversees – it’s really important the agency is well-run. Under former Governor Rick Perry, HHSC was rightfully criticized for bungling huge, multi-million dollar contracts – wasting taxpayer money and sometimes failing to deliver health care services efficiently. When Governor Greg Abbott took over three years ago, he made a big show of putting his own people in at HHSC and signaling with him in charge, things would be different. Not so much. It’s really just more of the same. Last Wednesday, Abbott’s HHSC Executive Commissioner, Charles Smith, appeared before House budget writers in response to two more state contracts being mishandled by the agency. That same day, the agency’s chief operating officer stepped down. Two days later, the deputy executive commissioner for procurement and contracting services followed and became the fifth departure in two short weeks over this new set of failed contracts that have followed years of contract mismanagement. The first of this month’s bungled contracts impacts Children’s Health Insurance Program (CHIP) providers servicing rural areas of our state. The agency incorrectly scored potential providers’ applications, resulting in the cancellation of five contracts worth $580 million. If that wasn’t bad enough, it was the competing providers, not internal agency controls, that identified the errors. Fortunately for CHIP recipients, the contracts were not set to go into effect until September 1, 2018 and current coverage will be extended to prevent a gap in service. The second set of errors were revealed via a State Auditor’s report outlining problems with a $17.5 million contract from 2016 for the maintenance of the state’s birth and death records database. As with the CHIP contracts, HHSC failed to use the correct methods to score vendor applications. HHSC officials also used incorrect information to award the contract to Genesis Systems, Inc. The errors ultimately led to the database launch being delayed by a year at a cost to taxpayers of an additional $1 million. These contracting errors are unacceptable. But what is even more unacceptable is what is missing from Smith’s mea culpa to the committee. It’s the millions of Texans — our state’s most vulnerable who rely on programs administered by HHSC — that Smith, our state’s leadership and this agency have let down. These contracting errors and mistakes have to stop. There is far too much at stake. Two weeks ago, 17 people in Parkland, Florida — 14 of them students — were murdered, shot by a 19-year-old with a semi-automatic AR-15 rifle. In the hours and days that followed, the students of Stoneman Douglas High School quickly turned tragedy into action by calling on elected leaders to do something to stop mass shootings. Their determination has inspired many more across our country to speak up and speak out. However, as has become the norm after a gun-related tragedy, many Republican leaders at both the state and national levels have succumbed to the extreme NRA’s influence. The head of the NRA, Wayne LaPierre, has made it clear that he cares more about the right of someone – even an 18-year-old – to buy an AR-15 than he does about school safety. He’s even gone as far to say that those in support of gun safety measures “don’t care about our schoolchildren. They want to make all of us less free.” How offensive. For some, the answer has been to increase the number of guns. For example, President Trump thinks that arming teachers is the solution. It’s not. He talks about a need for more mental health care — I agree, we need more access to care — but if he really cared about making mental health care more accessible, he would stop undermining the Affordable Care Act. Common sense solutions that have broad support from the American people, such as universal background checks, closing the gun show loophole, banning assault weapons like the AR-15 and raising the legal age to purchase a gun from 18 to 21 won’t threaten anyone’s freedom. They will, however, save lives. In addition to keeping guns out of the wrong hands, we need to look for ways to intervene when a child or adolescent shows signs of destructive behavior. In 2016, when I served on the House Select Committee for Mental Health, I learned how some Texas school districts have put mental health providers and centers on campuses and who are available 365 days a year to students, their families and school staff members. Austin ISD, which has taken a lead on providing these services, reports incredible results, including higher graduation rates, lower suspension rates and a more positive atmosphere on the campuses served. This could be replicated across Texas if there is the funding and the political will. Our state’s leaders must make this type of intervention a priority. Once and for all, we must do everything we can to stop high-powered weapons from falling in the hands of those who want to cause harm and we must make it a priority to help troubled children and adolescents before it’s too late. It is my hope that we see swift action at the federal level and that this issue carries through to the November election and on to the next legislative session. For far too many have died tragically in schools, churches, restaurants, movie theaters and other public places. It’s up to us to have the courage and conviction to do something to stop it. Today is the first day of early voting for the March 6th primary election. I think we can expect this year’s election – both the primary and the November general election — to be historic. People are fed up with Donald Trump and politicians like Ted Cruz and Konni Burton, who put extreme Tea Party interests above neighborhood schools, the economy and our healthcare. Beto O’Rourke for U.S. Senate – Beto is mounting a strong challenge against the extreme Ted Cruz. Beto’s grassroots campaign is inspiring a lot of people across our state and as our Senator, he will put Texas first, for a change. Marc Veasey for U.S. Representative, District 33 – We have one of the best congressmen around, and we need to keep him! Marc is a hard-working leader for Tarrant and Dallas Counties and is fighting for us and against the Trump agenda every day in Washington. Beverly Powell for State Senate, District 10 – I’ve known Beverly for more than a decade and know she will put people ahead of politics. With her service on the Burleson ISD School Board and years of involvement in our community, Beverly has what it takes to beat Konni Burton in November. When elected, she will be a strong advocate for Tarrant County, something we have been missing in Senate District 10 for the last few years. Devan Allen for Tarrant County Commissioner, Precinct 2 – I was fortunate to work with Devan when she served as my District Director and know firsthand her commitment and passion for serving others. When elected, she will be a needed addition to the Tarrant County Commissioner’s Court and a strong voice for Precinct 2. In addition, I know Devan will be an effective ally on key House District 101 priorities, including health care and transportation. If you live in Arlington, Grand Prairie, Mansfield or Kennedale and would like to learn more about Devan, Lisa and I are hosting a meet-and-greet event at our home in Grand Prairie onSaturday, February 24 from 2 to 4:00 pm. For more details or to RSVP, email vanna@mrmandco.com. Early voting runs through Friday, March 2nd. For Tarrant County early voting times and locations, click here. 2018’s going to be a good year – be part of it by exercising your right to vote! Last week, people across the state took to Twitter to share stories of public school educators whose sacrifices have made real differences in the lives of children across our state. The hashtag #blowingthewhistle was in response to a divisive and derisive campaign launched by an extreme right-wing group called Empower Texans. The intent of this anti-education group is to target public school employees and attack educators for their civic participation. As with many of Empower Texans’ stunts, this quickly blew up in their face.The #blowingthewhistle stories went viral and are more proof that Texas teachers are making a real difference in the lives of children and their families. @EmpowerTexans I am #blowingthewhistle on one my public school teacher friends. She has purchased several pairs of cool tennis shoes for some of her students. Thekids aren’t positive who they are from. They just magically end up in their locker. This way no one knows but them. @EmpowerTexans I’m #blowingthewhistle on my fellow teacher friend who takes time out of her weekends to take Senior pictures for free for students who can’t afford them so that they can have the same special Senior experiences as everyone else. I’m #blowingthewhistle on a teacher of mine that gave me a shoulder to lean on when I was crying, food when I was hungry, and a second family. Teachers don’t get enough credit for what they do. They do more than teach. They change lives. @EmpowerTexans I am #blowingthewhistle on a teacher who takes her student’s clothes home to wash every Friday afternoon so they will have clean clothes to wear on Monday morning. I hope you will join me and share a story about a teacher or school district employee you know. It’s not too late. We must continue #blowingthewhistle to honor these women and men. We must also give them the tools to succeed, such as increased funding and better support from elected leaders. Today marks the start of Black History Month, an annual celebration of African Americans’ incredible achievements and contributions to our nation’s history. During the month of February, I will highlight various African American leaders on social media and on my website. I hope you will join me in honoring these men and women and share the posts among your networks. This Sunday, February 4th, marks what would have been Rosa Parks’ 105th birthday. As you may recall, last year I passed a measure to name the Arlington and Grand Prairie portion of the SH 360 South extension the Rosa Parks Memorial Parkway. This will both honor her legacy and pay tribute to the rich diversity of our community. The Texas Legislature has designated this important Southeast Tarrant County road the Rosa Parks Memorial Parkway, in honor of an American hero whose courage helped to change our nation for the better. As a black woman in Montgomery, Alabama, in 1955, Ms. Parks was arrested for refusing to give up her seat on a city bus to a white man. This act of courage inspired the Civil Rights Movement, which aimed to eliminate racial discrimination and make the American Dream possible for all people. Ms. Parks’ fight for equality and fairness spanned her entire life, as she continued to tackle issues such as affordable housing and public education until her death in 2005. This spring, there will be an event to open the highway and unveil the plaque. As we get closer and confirm the details, I will send additional information so that you may mark your calendar. In the meantime, I hope we can all reflect on the rich contributions of African Americans in Texas and across our nation this Black History Month. In my Capitol office, on the wall beside my desk, hang two pictures of Dr. Martin Luther King, Jr. The photograph on top is of Dr. King waving to an audience of 250,000 on the National Mall in Washington, D.C. That day, he gave what many consider his most notable speech and where, in a booming voice, he delivered the words that moved a nation. 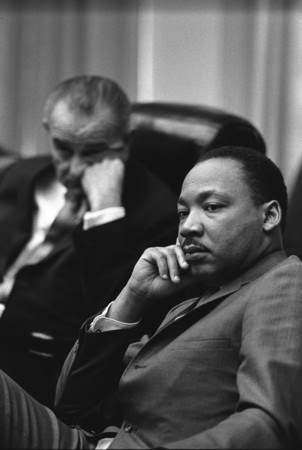 The picture below it is of Dr. King in the Oval Office, sitting in the foreground, listening, or perhaps deep in thought. President Lyndon B. Johnson can be seen behind him. I hung this photo as a reminder of the progress these two made addressing civil rights and voting rights. It also serves as a reminder of the constant battle to fight for and to protect these rights. Today, we remember Dr. King’s words, we celebrate his life and we honor his legacy. Let’s not just focus on thoughts and celebrations. Let’s act. Let us work collectively to serve our communities and make our cities, state and country a better place for all. 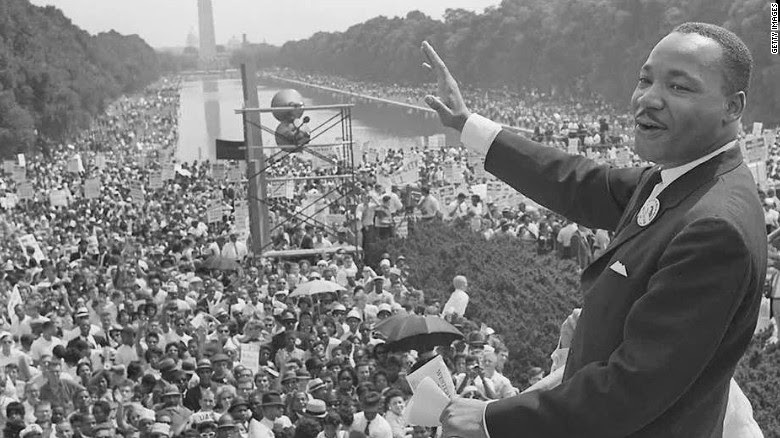 The night before he tragically died, Dr. King delivered his final speech. In it, he challenged those listening to come together to work for the greater good. These words ring as true today as they did in 1968. I ask you to please join me in making a commitment to stand with greater determination and to help the people in our communities, our state and our nation. Not just today, but every day. “Serving the constituents of our district is the best and most important part of my job,” Turner said. “I look forward to continuing to work on behalf of Arlington and Grand Prairie by fighting for local priorities, such as transportation. I will also continue to work hard for UT-Arlington, Tarrant County College and the Arlington and Mansfield school districts. “In Austin, I look forward to continuing to fight for greater transparency and ethics reform, better access to healthcare, more funding for public education and making higher education attainable for all Texans who want to attend college,” Turner continued. Turner has received numerous awards and honors for his legislative service, including “Legislator of the Year” from the Texas Veterans of Foreign Wars (2009), “Best of the House” from the Combined Law Enforcement Associations of Texas (CLEAT) (2013), “Legislative Champion”from Planned Parenthood Texas Votes (2017), the Sierra Club of Texas’ “New Leadership in Environmental Protection Legislative Service Award” (2013), and “Champion of Equality” from Equality Texas (2013 and 2015). Turner is a native Texan who grew up in Dallas and is a graduate of the University of Texas at Austin. A 20-year Tarrant County resident, Turner lives in Grand Prairie with his wife, Lisa. The Democratic primary election will be held on March 6, 2018. There has been a lot of talk in recent days (and weeks and months) about the Affordable Care Act (ACA). Unfortunately, much of the focus has been on the attempts to dismantle the law, even though the result could be 32 million Americans losing their health insurance coverage. to fail, with no concern for what that will mean for millions Americans, including 1.7 million Texans who rely on health care coverage through the Health Insurance Marketplace. Last week, Trump announced that he would cut payments to insurance companies. These payments offset the costs to insure low- to middle-income Americans and the impact of this reckless decision will have dire con-sequences and many will no longer be able to afford coverage as a result of this decision. Of course, this is just one of many ways that the Trump Administration has deliberately sabotaged the ACA — if you’d like to see a more comprehensive list of other ways they are trying to deny health care to Americans, click here to read a recent New York Times story on the matter. With just two weeks until Health Insurance Marketplace open enrollment begins, there must be more focus on ensuring that our neighbors are able find and keep their coverage. 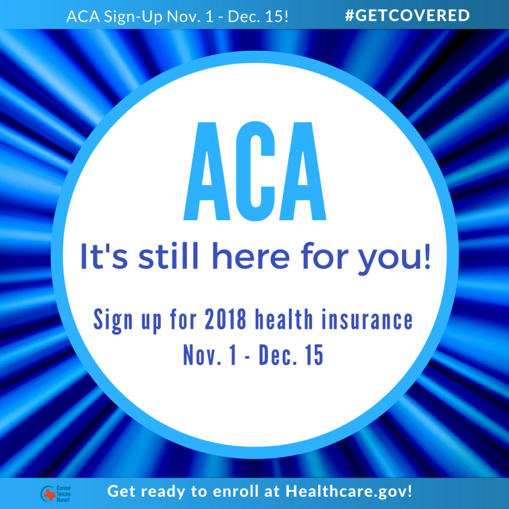 Help spread the word — this year’s open enrollment period, which has been shortened considerably from past years — begins November 1st and goes through December 15th. For more details or to find a health insurance plan, visit the healthcare.govwebsite. For those in House District 101 or in other parts of North Texas, you may also contact the Community Council of Greater Dallas if you have questions about enrolling or about your application. On the topic of the Affordable Care Act, last Tuesday, I joined the Arlington NAACP at their monthly general meeting, where they discussed the upcomingACA open-enrollment period. Since the Health Insurance Marketplace opened, the Arlington NAACP has been on the frontline spreading information about how to apply and helping members of our community sign up for coverage. On Wednesday, I was honored to receive the “2017 Legislative Champion Award” from my friends at Planned Parenthood Texas Votes. The organization has been instrumental in fighting to increase access to health care across Texas and protect a woman’s right to choose. I am proud to stand with them. 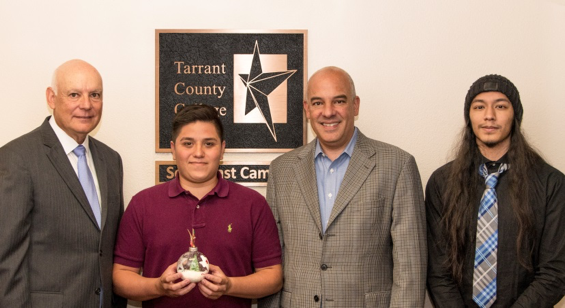 students from Tarrant County College Southeast Campus have designed the HD 101 ornament, which will be hung on the Christmas tree on the House floor. On Thursday, I met this year’s artists, Elijio Ledesma (L) and Jose Villa (R), pictured above with TCCSE President Dr. Bill Coppola. The TCCSE students both plan to pursue careers in graphic design. We’ll post close-up pictures of the finished ornament when it’s placed on the tree in the Capitol. For locations and times, click here. For polling locations, click here. If you know of an event in or near HD 101 that you would like us to feature, please send an email to chris.turner@house.texas.gov. Health Care: Take Action Now! This week on Capitol Hill, there’s been a lot of talk about the Graham-Cassidy healthcare bill, the Republicans’ latest scheme to repeal Obamacare. I know that it’s hard to keep track of all the proposals the Republicans in Washington have been floating around; however, according to every report I’ve read, this may be, by far, the most harmful plan yet. According to the Center for Budget and Policy Priorities, if Graham-Cassidy becomes law, those with low to moderate incomes, Medicaid recipients (read: seniors, people with disabilities and families with children), and people with pre-existing conditions will be the most negatively impacted. Based on Congressional Budget Office calculations of a previous measure, it’s estimated that a repeal-and-replace plan like Graham-Cassidy could mean 32 million people would lose healthcare coverage. That’s clearly unacceptable – and that many people losing health coverage simply means that health care costs will skyrocket for everyone as health care providers provide more and more uncompensated care. If that’s not concerning enough, the federal government will give states block grants and control of how the money is spent, the power to determine what will be covered and how much that coverage will cost. There are several problems with this. Among them, block grants would disappear after 2026, leaving states to fully cover the cost, unless Congress reauthorizes the funding. Even worse, block grants will give state leaders the power to decide whether or not insurance companies have to cover pre-existing conditions, mental health care, substance abuse and maternity care. I am afraid of what Texas’ leaders would do with the money. Our current governor has been very vocal in his opposition to the Affordable Care Act and has refused to expand Medicaid, which would insure another 1 million Texans. That’s compounded by the fact that our state has a long history of failure when it comes to healthcare. Two years ago, Texas Republicans directed the Texas Health and Human Services Commission to slash spending for acute therapy services for kids, resulting in thousands of children being denied access to speech, occupational and physical therapy. In 2003, Republicans passed a bill that made it harder for lower-income working families to get CHIP health coverage for their kids. As a result, in the three years after the bill was signed into law, 215,729 children lost access to their health coverage. To add insult to injury, the bill required the privatization of the implementation of the program, at a cost over nearly $1 billion that resulted in scandal and fiscal mismanagement. It’s important to point out that it’s not just Democrats who oppose the Graham-Cassidy bill; many Republicans do too. Several Republican and Democratic governors have sent a letter calling on Senate leadership to shelve the Graham-Cassidy measure and instead work toward a bipartisan solution. I hope more Republicans lend their voice in opposition and soon. This bill is on the fast track. What can you do to help stop this assault on health care? Join me in contacting Senators John Cornyn and Ted Cruz to tell them to oppose Graham-Cassidy. This is a bad bill for Texas and for people across our nation. Let’s make our voices heard.